The five largest U.S investment banks reported over $2.5 billion in M&A advisory fees in Q3 2018 – a reduction of roughly 7% from the figure of $2.7 billion a year ago as well as in the previous quarter. The decline was largely expected, though, as M&A activity over the last two quarters has been notably depressed, and the figure for Q3 was propped up primarily by a strong pipeline of mega deals announced over late 2017 and early 2018. However, Goldman Sachs did well to report M&A advisory fees of $916 million for the slow quarter – its best quarterly performance since the downturn besides the record $961-million figure in Q1 2015. In fact, this is just the fifth time in its history that Goldman’s M&A advisory desk reported total fees in excess of $900 million (along with Q3 2007, Q4 2007, Q1 2015 and Q3 2017). We capture the trends in M&A advisory fees for each of the five largest U.S. investment banks over recent years in detail as a part of our interactive model, while also forecasting how these revenues are likely to change in 2018. We highlight key observations related to their M&A advisory fees below. There has been a steady improvement in M&A advisory fees for the largest U.S. investment banks since the downturn, with the average quarterly M&A advisory fees for these five banks climbing from an average figure of $1.8 billion over 2008-2014 to $2.55 billion over the last five quarters. The table below details the trend in M&A advisory fees for each of these banks in the last five quarters. The green-to-yellow shading along a column highlights the relative performance of each bank in any given quarter. These banks have historically captured around 30% of the global M&A advisory wallet share for any given quarter – highlighting their strong grip over the highly competitive industry. However, their wallet share has fallen to below 23% on a few occasions in recent quarters (including Q3 2018) because of the notable increase in deal volumes in developing countries, especially China, over the last few years. 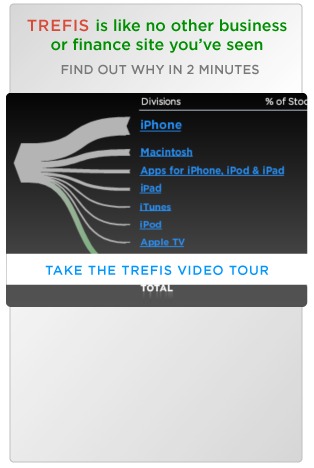 As these markets are extremely fragmented, and as the U.S. banking giants have limited presence in these countries, this has weighed on their market share as well as wallet share. Notably, Goldman’s reported figure of $916 million for Q3 2018 was only slightly higher than the figure a year ago, although it increased 14% sequentially. Also, Goldman generally reports M&A advisory fees that are 20-30% higher than that of its nearest competitor each quarter, with the exception of Q1 2018 when Goldman topped the list despite reporting an unusually low fee figure. 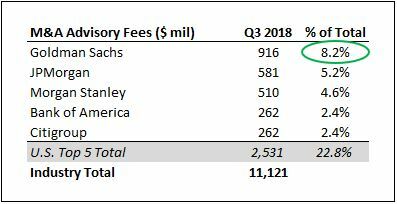 To put things in perspective, Goldman’s advisory fees for the last five quarters (excluding Q1 2018) have been 45% higher than the sum of these fees for the second-ranking bank over this period (JPMorgan).